Antelope Camera Systems specializes in the development of mini cameras and high-speed imaging technology for the broadcast market, providing solutions for sports and live event production as well as feature and documentary films. The Antelope camera family — together with the first fully integrated real-time deflickering solution for live broadcast slow-motion systems — are the major products developed by Antelope Camera Systems. The company offers the world’s smallest, fully integrated professional 2K and 4K HDR live broadcast cameras: Antelope Femto, Antelope Nano, and Antelope Ultra 4K. Antelope Camera Systems is also well-known for its smallest high-speed camera, Antelope Pico, which provides stunning, slow-motion perspectives in live broadcast at 350fps in native HD, while simultaneously outputting a 1080p50/60 signal via HD-SDI for live television production. DoCaption’s flagship LRBox line features a comprehensive series of hardware tools for 3G/HD/SD-SDI ancillary data management including, but not limited to, closed captioning and subtitling. The cost-effective, versatile LRBox provides on-the-fly video ancillary data insertion, extraction, and bridging capabilities, together with an on-screen-display engine for monitoring. The most recent addition to DoCaption’s LRBox platform, the scoreboard data encoder and decoder, allows for frame-accurate insertion of scoreboard data into an SDI video signal. The system receives data from various scoreboard brands by connecting directly to them using their specific protocols. In sports applications, this process ensures video is perfectly synchronized with the game clock, ultimately improving the accuracy of game replays and official reviews. VidOvation is a leading provider of video, audio, and data transmission and distribution systems for the broadcast television, sports, corporate AV, and government markets. 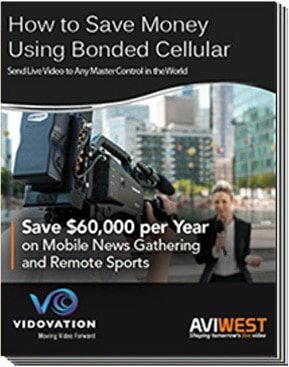 Encompassing bonded cellular, professional wireless video, video streaming, video networking, encoding, IPTV, and fiber-optic communications systems, VidOvation solutions improve video transmissions by removing the frustrations of signal loss, latency, interference, noise, and security issues. VidOvation excels in helping its clients integrate custom solutions into existing infrastructure, with the ability to satisfy almost any application or budget. The company applies proven expertise to the complete project life cycle — from project consulting and management to engineering and design, to warranty and support. Learn more about how VidOvation is moving video forward at vidovation.com.